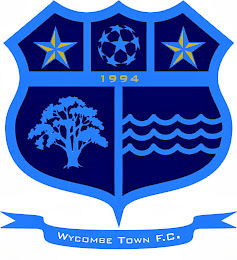 Wycombe Town FC: TWO WINS FOR TOWN! Two wins today for Wycombe Town FC, the first team played out an exciting match with a good FC Bentons team in the Berks & Bucks Intermediate Cup and the Reserves visited Hithercroft in a division two match. Still finding their feet Town kicked off and pressurised the Bentons defence but failed to hit the net, two quick break away goals saw Town two down against the run of play after thirty minutes! playing some good passing football Town fought back and went in at half time 3-2 in front. The second half Town began to dominate the play and Bentons were relying on counter attacks, Town got another goal to make it 4-2 but Bentons wern't finished and got one back. Town began to dominate again and deservidly scored two more to make the final score 6-3 and secure a place in round two. Scorers were Mike Butcher and Andy Nicol two each, Rikki Gilbert and Darren Crane one each. Wycombe Town FC in their new away kit! Wycombe Town Reserves travelled over to Amersham to play Hithercrof FC and dominated the game playing some great football and scoring 5 goal without reply, this has propelled them well up the league table. Scorers were James Hall with three, Steve Perry and James Forbes with one each. TOWN START THE SEASON WITH A WIN!